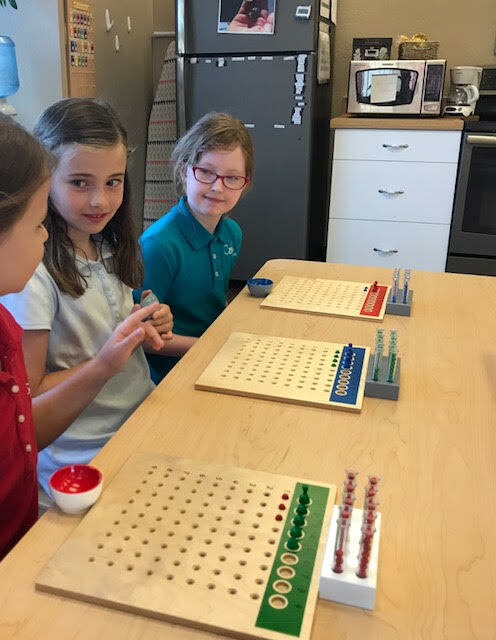 The main idea to hold true to the Montessori Method is Dr. Montessori’s greatest belief that she expressed in everything she wrote and in every lecture she gave: “what the hand does, the mind remembers.” (M.M.) It is a hard rule she insisted upon, and it is feverishly given to the guides in training. We must trust the material to isolate a concept and through its manipulation the student will gain the full depth of the idea displayed in front of him or her. When is the child ready to move to pen and paper (work abstractly)? 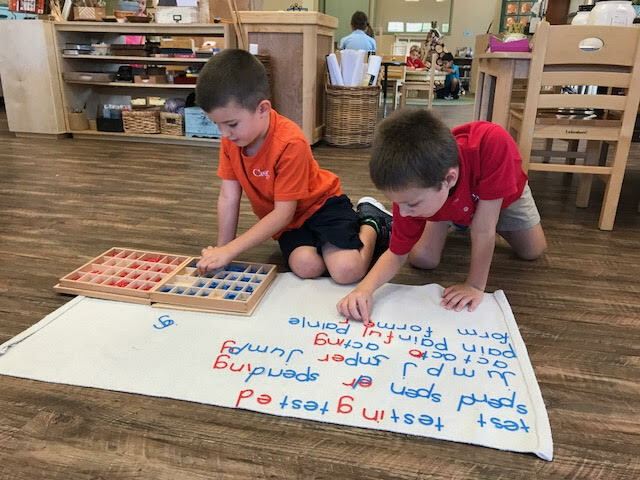 We understand this happens when the child demonstrates he or she has internalized the patterns, sequence, or logic of what is being presented and no longer needs the Montessori material to manipulate the concept to gain an accurate result. In mathematics the material represents the abstract concepts of fundamental operations and assists in the development of the child’s “mathematical mind”. By manipulating the material the child has a logical, clear and visual way of grasping the concept. They can see and feel that 10 is more than 1 and that 1,000 is a quantity much larger than 1. Not just by the notion of memorizing a number or seeing it on paper but by the exercise of actually counting beads to internalize how much more counting is necessary to get to 1,000. This is extremely important when the child moves into dynamic operations (carrying the 1 to the next category). They get to visual and physically carry over to the next category. They see math and the manipulation of quantity and can then begin the process of analysis and working story problems, which brings them to the abstract of mathematic work. The most important gift the concrete material gives the child is to bring order and sequence to the understanding of mathematical computations, theorems, and problem solving. Language work provides a fantastic break down of each function of words and with symbols and colors children are able to compartmentalize language and truly get a since of all the Parts of Speech and their use in a sentence. Sentence analysis work is what outside of Montessori is called diagraming sentences. This material is also a gift to the child in breaking down syntax and sentence structure and physically moving words in a sentence to truly understand its position in a sentence and purpose. The beauty of Cosmic Education lies in all the charts and timelines that lays out an amazing amount of concepts that are presented in a concrete way that can be manipulated, organized, replicated and recompiled in a way that is meaningful to the child in the intent to internalize the concepts and expand beyond what they know. Only until the information is internalized can the child truly express him or herself abstractly. In our classrooms the children enjoy the freedom to work with Montessori concrete material, books, educational objects (globe, maps), specimens, nomenclature (information cards), art supplies and lots and lots of paper to express their acquisition of new knowledge. Though the sensorial practice of the word problems on solving for distance, time, and speed the children develop the ability to efficiently select the appropriate process to solve a problem. The students practice multiplication facts sensorially with the Chequerboad, which is a striking concept of materialized abstraction. The process of work is closely parallel to the multiplication algorithm. Repetition of phonograms through variety of different approaches allows the students to retain the phonograms and use them in their correct spelling and fluent reading. By grading the sounds of the diatonic major scale the student trains his ear for later work in composing music. Work with the real-life specimen provides the child with the nomenclature for the parts of a plant. By crossing out all the multiples of the prime numbers, which are circled, the student sieves numbers up to 1,500 to make the prime numbers visible. Using grace and courtesy with the librarian to find books of their interest. The students practice partitive long division of the whole numbers with the material, which later allows them to grasp the division algorithm with ease. The students use classroom books about architecture to find out what kind of houses people used for shelter throughout history. After exploration of the production of their own country the students became curious about what is produced and where in the world. The grammar symbol (a bridge) provides an image of the abstraction of the part of speech and brings awareness that the preposition is a word that shows relationships between/among nouns or their substitutes. Through the sensorial work of making sentences with the cards of different parts of speech where the actions are changed (isolation of difficulty) the students get the awareness that verbs denote actions. When practicing the lesson students get a sensorial image of the composition of a binomial cube. Through variety of materials the students work on retaining the phonograms for later use to spell correctly and read fluently. After listening to the Story of Creation of the Universe the students use their imagination and the science materials and different ingredients to reproduce the process when the hot particles needed to move upward and burst out through the Earth's crust. The Story about the Timeline of Life became a departing point for the study of mammals that spread on the Earth after reptiles disappeared. These two children decided to observe our classroom specimen (Little Foot) to understand characteristics of a reptile. Using a Montessori Material, these children are exploring how angles are made and their names. For example, Straight Angle, Right Angle, Obtuse and Acute Angles. After a lesson on circuits, the children wanted to further explore possibilities of making electricity. Sensorially what they are exploring is that, the potato itself has a mixture of starches and salts and some water. A salt, like table salt, in water releases ions. Ions are atoms that have an electrical charge. Table salt releases two electrically charged ions ; a sodium ion with a positive charge, and a chlorine ion with a negative charge. These children are practicing their Grammar Boxes as they symbolizeeach word according to part of speech. In this particular lesson they're studying about the preposition; simply put, these are words that indicates a relation between things mentioned in a sentence. This Child ended up studying the human skeletal structure after investing how a horse and a human can be classified as under Mammals. He's beginning to realize that they're are similarities as he started to compare characteristics. The bank game is an exercise children enjoy. It involves movement such as going back and forth. This lesson gives another opportunity to work with big numbers and mental calculation. After observing numerous specimens through the microscope, this child is putting his experience into words. These are the beginning stages of scientific classification work. It also leads to focus and concentration, enrichment of vocabulary and engage the reasoning mind of the second plane child. After researching the periodic table and its elements. This child wanted to focus on radio active atoms. This is her presentation of some of the effects that could occur. 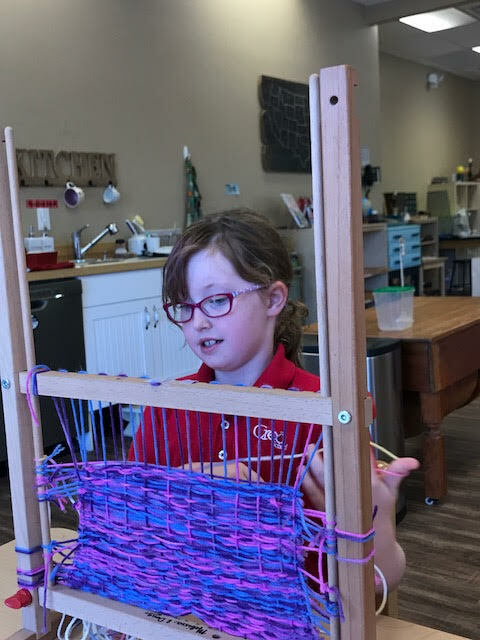 This child is making a purse for her pencils by using a wooden loom. This gives repetition which indirectly develop focus, eye hand coordination which involves a mathematical sequence and the joy of creating something practical from scratch. While sitting at a presentation, this child is getting to explore a possible 'weapon' the Hohokam culture may have used to protect and hunt. 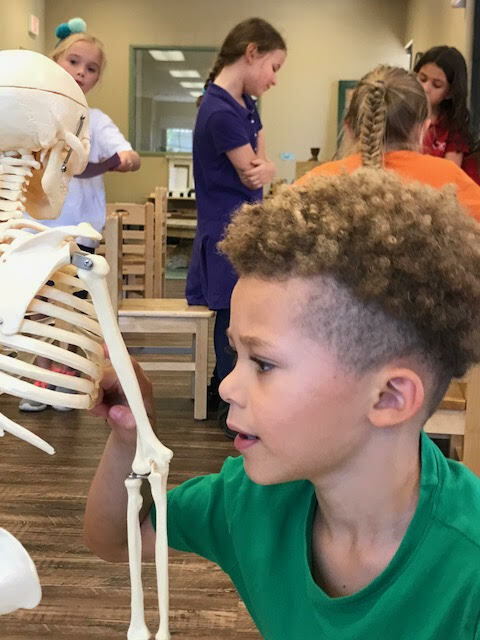 After studying some names of the Human Skeleton, these children are playing a game where they get to place each bone name on their friends body. After researching about the Native American culture, this child created how a village might have looked . A long division problem such as, 1,856,249 ÷ 258 =? is done by 3 friends working together. For example, each one of them becomes responsible for their board such as the units, tens and the hundreds. As they divided, the group must follow the rules of division. They also have to transfer and exchange any beads that are left from their cup amongst each other in a systematical manner while sharing equally to find the quotient. 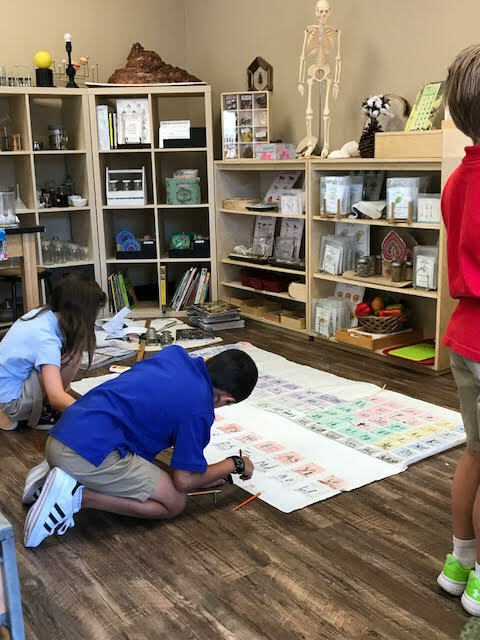 After studying and researching about the periodic table, this group of children wanted to create a large version of the table to hang over our science section. They wanted to share what they've learned with their peers. This group of children are working hard to find the scientific names of early creatures that came and went extinct. By using the Coming of Life chart, they were able to navigate the real creatures and their stories in our prehistoric books. Anything that's weird and gross excites them! The day after our first social, the children gathered outside to clean the mess that was still to be seen on the play ground. From this experience, the children learned that together they can accomplish tasks faster, how to become responsible citizens and the importance of keeping our Earth clean for we have only one home. Children got the opportunity to experience and develop skills with some cool coach's while they were swinging bats and throwing base balls around! 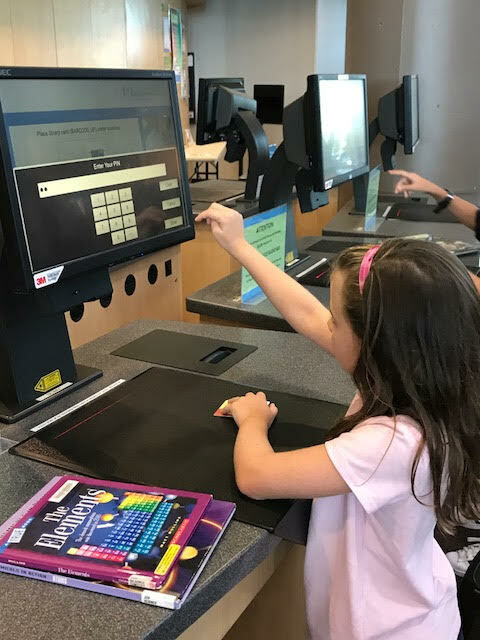 This child is using the library computer to check-out her books. These going outs satisfies the second plane of development as they become curious about how the real world works. After receiving a lesson about Layers of the Earth, this child is creating her version of the layers of the earth. These follow up work gives opportunities to deepen their understanding of they've just learned. These two children are learning how to recognize prefixes and suffixes. Having two different colored alphabets, its become clearer to the child that the parts that get added to the root is either prefix or suffix. This work involves walking back and forth carrying each word in their head. This is another fun way to help them practice their spelling. As they keep exploring, they might choose a root word and see how many suffixes / prefixes they could add to the same root! 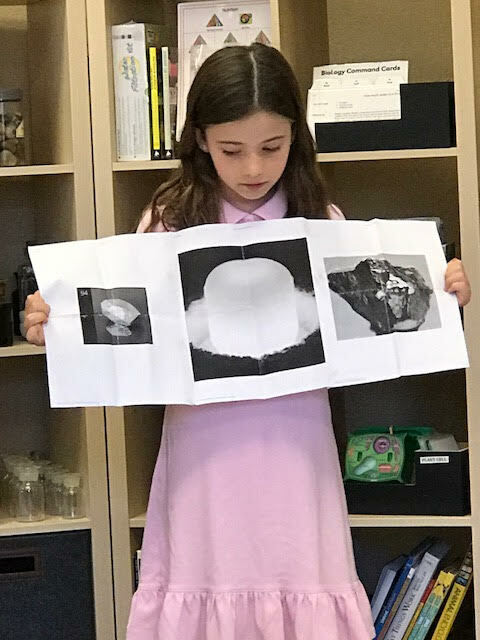 After creating the layers of the earth, this child gets to cut her clay 'earth' in half to see the layers inside the Earth. These types of follow up work bring satisfaction to the child and fill their cup with excitement. As the Guide tells the story, we encourage them to use their imagination. With the help of the Sun, the children get to experience how laws of the Universe may have come about. Through this story / chart, the children begin to discover how Human Beings found materials from their immediate environment to survive, different ice ages that took place, how controlling fire had a big impact and tools they made from scratch to hunt, protect. Usually this story leads towards the children wanting to explore possibilities of making their own tools to hunt or ways to create fire by finding natural materials from their environment!